" Lonely Planet at MetroStage is a quiet and powerful recollection of AIDS crisis"
" Lonely Planet is an entertaining, powerful, and heartfelt experience that should not be missed." " MetroStage made an excellent choice in showcasing Lonely Planet, a warmhearted and memorable story of friendship featuring two outstanding acting performances." Carolyn Griffin, producing artistic director for Metro­Stage, knew that bringing in Vreeke, who has a special knack for getting finely detailed, emotionally nuanced performances from actors, (Michael Russotto and Eric Sutton) would suit Dietz’s script to a T. The production just charms you. "Lonely Planet is an entertaining, powerful, and heartfelt experience that should not be missed"
It’s a roller coaster of emotions – sometimes quiet, sometimes funny, sometimes heartbreaking, but always powerful, charming, and meaningful. It’s emotional, real, well-directed and performed. Producer Carolyn Griffin assembles a dream team for this production: Director John Vreeke and actors Michael Russotto and Eric Sutton. Skillfully directed by John Vreeke, this "Lonely Planet" is a tour de force for Russotto and Sutton, both of whom describe their characters with sensitivity and humor. Tony Kushner’s metaphysical two-play epic “Angels in America” (1992) and Larry Kramer’s furious drama “The Normal Heart” (1985) fumed and exhorted on a shared topic — the 1980s HIV/AIDS epidemic. Both in their different ways brought audiences simultaneously to tears and fury, and they still can. “Lonely Planet,” the lovely 1994 dramedy by Steven Dietz, takes a quieter path, but it can still break hearts. MetroStage has produced a sterling revival of it that runs through June 17. It is acted with such skill and sensitivity by Michael Russotto and Eric Sutton — under John Vreeke’s direction — that even the script’s occasional lapses into preciousness don’t really cloy. The production just charms you. Carolyn Griffin, producing artistic director for Metro­Stage, knew that bringing in Vreeke, who has a special knack for getting finely detailed, emotionally nuanced performances from actors, would suit Dietz’s script to a T.
The time is 1988, the place a musty map store in an unnamed American city. 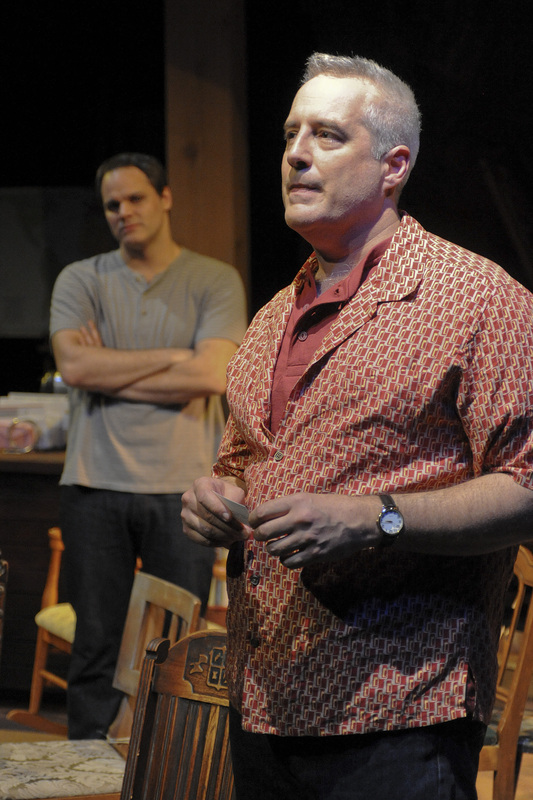 Jody (Russotto), the proprietor, is a shy, doughy, 40-something gay man with a gray crew cut. Jody can wax poetic about the beauty and reliability of maps as things you can depend on. Well, apart from what he calls “the Greenland problem.” This, he explains to his friend Carl (Sutton), refers to the phenomenon that on some world maps, flattened out to give sailors accurate longitudes and latitudes, Greenland looks deceptively enormous. The AIDS epidemic is Jody’s Greenland — taking up enormous space in his shrinking world. He knows there’s more than death outside his shop, but his heart is filled with Greenland: HIV/AIDS. Beyond his door is a scary world where friends and acquaintances are dying. That’s why Carl, a younger, more flamboyant man of a more sociable nature, bursts into Jody’s shop at all hours with news of the world in an effort to get his friend to venture forth. But much of Carl’s news lately is of death. To prevent the increasingly agoraphobic Jody from tuning out entirely, Carl starts bringing into the store a chair from the home of anyone they know who has just died. It begins with just one Early American spindle-back chair, but by the second act the shop is chock-a-block. The play’s bald-faced nod to the 1952 absurdist classic “The Chairs” by Eugene Ionesco — the characters read and discuss it — seems like a forced injection of intellectual whimsy, but Vreeke’s low-key production makes it work. Even Carl and Jody’s silly swordplay moment, using rolled-up maps as weapons while spouting ­pseudo-Shakespearean dialogue, plays easily as do their occasional, not really necessary, remarks to the audience. A great, unspoken help is Jane Fink’s set. The designer has made the theater’s small stage look like a spacious old storefront. A wide, weather-beaten door with a transom and an aging pull-shade occupies one side of the stage, hinting that the outside world isn’t far off. Near the center sits a large wooden storage counter where Jody presumably does business, if he ever has a customer. It has those wide, shallow drawers for big documents. Scattered about the place are baskets of rolled-up maps. Sound designer Christopher Baine takes us in and out of scenes with snatches of old rock hits, most particularly Bob Dylan’s “I Shall Be Released” in Joe Cocker’s gravelly, barely intelligible cover. A few street noises might have added interest to the soundscape and given more of a sense of the encroaching world, but Vreeke may have wanted “Lonely Planet” to unfold as if in isolation — as if on the moon, in fact. In a sense, it does. Hung high in Jody’s store is a snapshot of Earth taken by the astronauts of Apollo 17. As the chairs pile up in Act 2, and the plague inches closer, the whimsy in which Jody and Carl like to engage turns out to be nearly as essential to weathering the crisis as the drug “cocktail” medical researchers were struggling then to perfect. and heartfelt experience that should not be missed"
Russotto and Sutton are both fantastic and are so believable. Their interactions are so emotional and heartfelt. You feel for this ‘Odd Couple.’ You relate to the way they annoy each other. You admire their friendship, understand their obsession with their chairs and maps, experience their personal loss of friends, and most important - you feel their fears that they could ‘be next.’ Humor is the most effective medicine (at that time), and it sustains them both as the plague creeps closely to the map store’s front door. 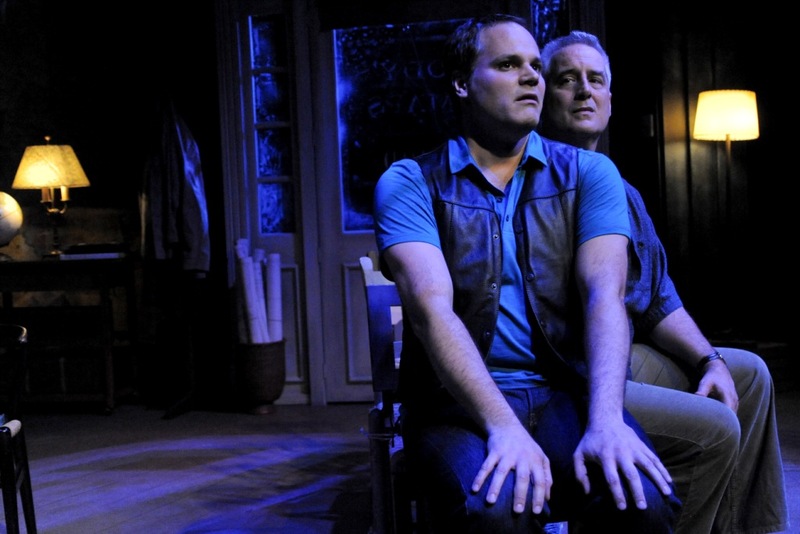 Many plays dealing with the heart of the AIDS crisis feature justifiable anger and fury. Yet Steven Dietz’s 1994 play Lonely Planet demonstrates that a gentle approach can be just as powerful and touching, as it is in the excellent production now playing at MetroStage. 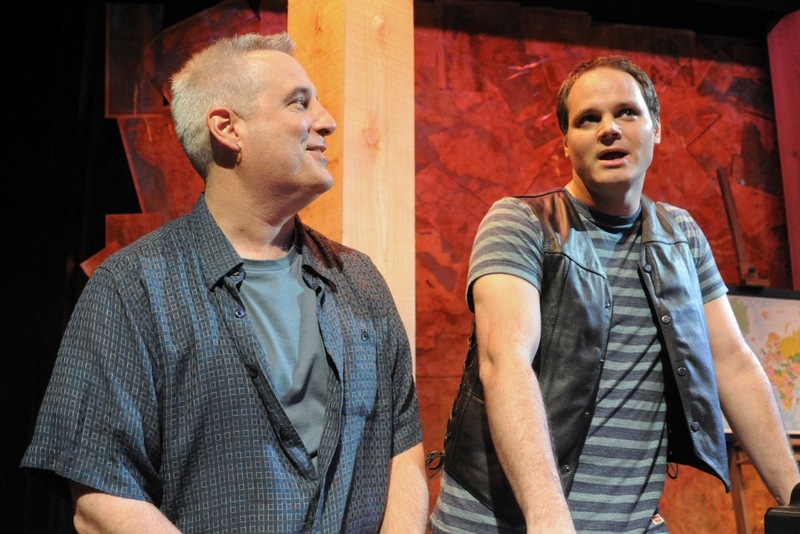 Lonely Planet is the story of Jody (Michael Russotto) and Carl (Eric Sutton.) Jody, the older of the two men, owns a map store. His response to the death of many friends is to retreat inside himself. He is finding it harder to leave the store, to keep it open, or even to answer the phone or door. He finds it increasingly difficult to remember the details of his past, but can clearly describe his haunting dreams. His depression and fear of the outside world are on the verge of overwhelming his life. Fortunately, Jody has a friend in Carl. Carl is a much more flamboyant and energetic man who has a totally different response to the loss of their friends. He constantly urges Jody to leave the store. He starts bringing an odd menagerie of chairs to Jody’s store. The store becomes increasingly cluttered, much as the minds of the two men are increasing occupied by the memories of dead friends. Carl understands that Jody needs him to keep from being crushed by reality. Carl spends so much time at the store, gently pestering Jody, that he seems to get more calls there than Jody does. Jody, in response, calls Carl the little brother he never wanted to have and pleads with him to make someone else his project. Lonely Planet opens slowly and proceeds at an unhurried pace. The late 1980’s setting is gradually made clear through dialogue and music, especially the Joe Cocker rendition of Jody’s favorite song, Bob Dylan’s “I Shall Be Released”. The play never explicitly mentions the word AIDS, which only serves to give its background of sadness and mortality a growing omnipresence for the audience. The play’s slow moving plot requires a little patience from the audience. For example, the second act mostly revolves around whether Jody can be persuaded to leave the store to get tested. But wait for it – the story resolves itself in a melancholy yet hopeful manner, and the ride to resolution is made enjoyable by the interactions of these two interesting characters. The play’s tempo allows for some interesting digressions. Jody describes the distortion of maps, such as the Mercator projection map that makes Greenland appear huge because of its perspective. The fact that his friends are dying is his “Greenland problem” because it distorts his view of life. Similarly, one’s view of our own lives can be altered by a famous picture of Earth taken by the Apollo 17 crew which at times is projected above the set. Carl’s collection of chairs leads to a lengthy discussion of the Ionesco absurdist play The Chairs. 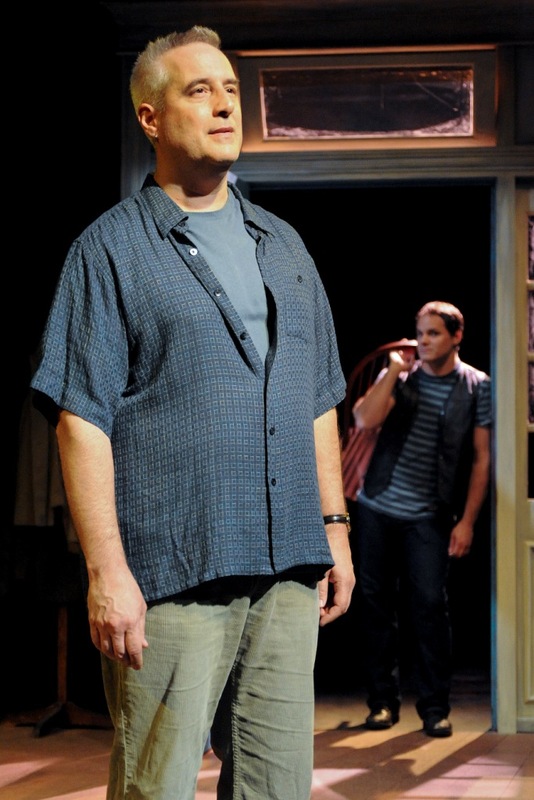 Carl is the showier of the two roles and Sutton gives the character (and the play) a welcome jolt of energy and humor. While Russotto has given many fine performances in recent years, his ability to fall naturally into the role of Jody and give him an endearing humanity may be one of his finest accomplishments. With a play in which the actors deliver such nicely detailed portrayals and have such a natural rapport, credit must go to the director, John Vreeke. Vreeke also has the confidence to trust in Steven Dietz’s script and lets the story play out gradually while capturing the humor and the emotional highlights. He strikes a good balance between the simplicity and the fanciful nature of Lonely Planet. To describe Lonely Planet as an “AIDS play” is accurate yet incomplete. It is really more of a story about friendship and its importance in a troubling world. The term Lonely Planet is an apt description of the famous picture of Earth from space. It helps make us all humbly aware of our relative insignificance and the importance of relationships. While the story has a nice degree of specificity, the story has more universal themes which make it worth seeing for any audience. The map store set created by Jane Fink is strewn with maps, globes, books, and (eventually) chairs. It not only seems realistic, but it serves to match Jody’s character. The lighting design of Jessica Winfield has some nice highlights, especially as the play moves to its resolution. Recently there have been revivals of AIDS era plays, such as the recent Broadway production Larry Kramer’s The Normal Heart which won three Tony Awards last year and is coming soon to Arena Stage. As the best of these plays demonstrate, this theatre is both reminiscent of an era but also able to have meaning beyond their immediate circumstances. 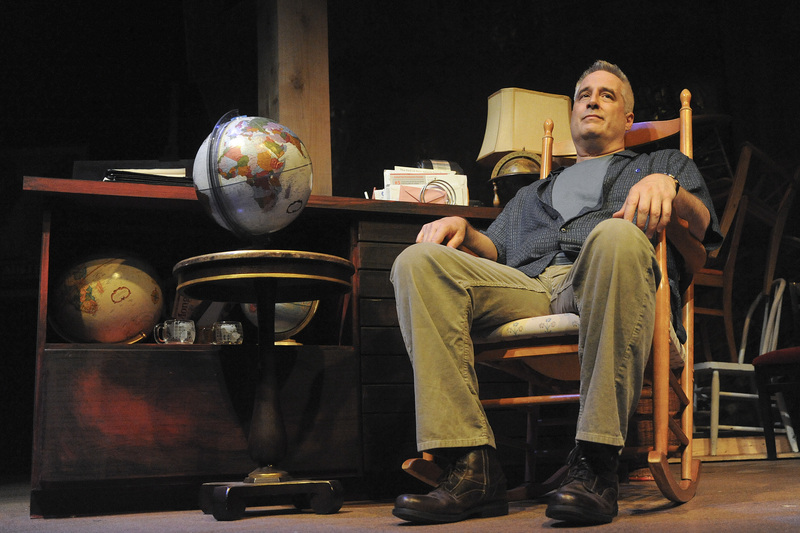 MetroStage made an excellent choice in showcasing Lonely Planet, a warmhearted and memorable story of friendship featuring two outstanding acting performances. In 1994, Steven Dietz wrote a play called "Lonely Planet," which takes place in a small map store "in an unnamed American city" in 1988. Its only characters are Jody and Carl. 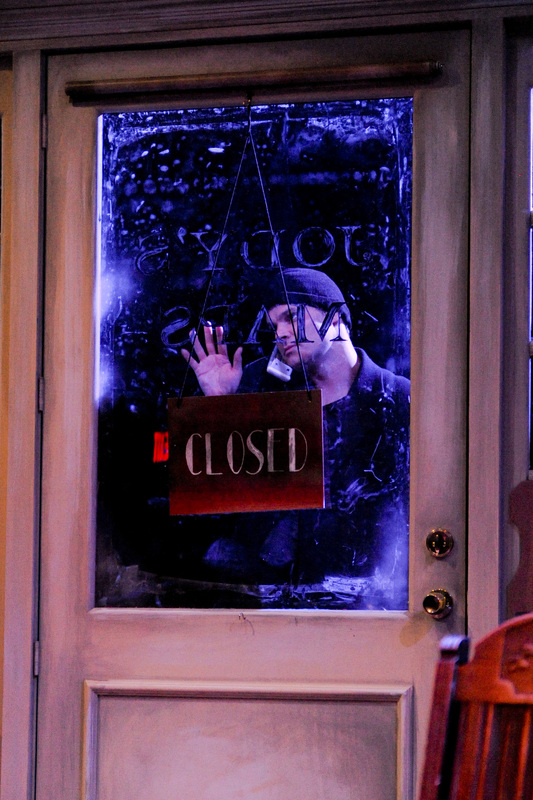 Jody owns the store and suffers from agoraphobia, so he fears going outside. Carl is Jody's polar opposite, sociable, flamboyant, always popping into the shop. 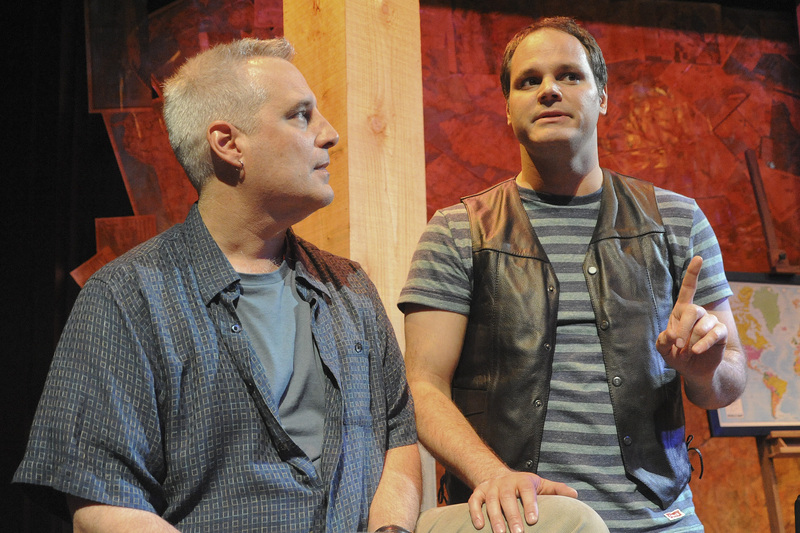 Yet, as the excellent MetroStage production makes clear, Jody (Michael Russotto) and Carl (Eric Sutton) are drawn together by a painful truth. Their friends are all dying. Although AIDS is never mentioned, it's clear that it is the disease that is killing their friends, a threat to them individually and to the society they inhabit. Dietz allows Jody and Carl to talk about the horrific nature of the disease in both conventional and unconventional ways. He uses monologues, for instance Carl's monologue about his first best boyhood friend, to mark the agony Carl feels when that friend dies. In a more unconventional way, Dietz makes reference to Eugene Ionesco's absurdist play, "The Chairs," to underscore the bizarre nature of the world his characters live in. Jody happens to be reading the play, which conveniently allows Dietz to explain the plot. Dietz also allows Carl to act out the play, filling Jody's shop with chairs he takes from the homes of his friends who have died. As the map store gets stuffed with every conceivable kind of chair, Dietz achieves the same kind of absurdity Ionesco did in "The Chairs," where a couple fills a room with an endless supply of chairs for invisible guests. Skillfully directed by John Vreeke, this "Lonely Planet" is a tour de force for Russotto and Sutton, both of whom describe their characters with sensitivity and humor. Russotto makes it clear why he is drawn to the world of maps, which try to make a disorderly world look orderly. He is capable of being entertaining and scholarly at the same time, as in his description of the "Greenland Effect," where Greenland looks abnormally large on old Mercator maps, which flattened out the globe in order to make navigation easier. Sutton is excellent as the increasingly manic Carl, who sees his world slipping away day by day. He not only salvages his dead friends' chairs; he also takes on their jobs. Jane Fink's set for "Lonely Planet" is an exquisitely warm, inviting place, with an ancient, burnished aerial map on the back wall, seven globes of different sizes and endless baskets of rolled maps. In the final scene, the set offers a sense of comfort and constancy: people may die, land masses may shift, but maps -- like Jody's and Carl's friendship -- create a sense of continuity. When an entire cast consists of only two characters — such as in Steven Dietz’s play, “Lonely Planet” — be assured the piece will reveal a deep exploration of the psyche. This thoroughly engaging, Ionesco-influenced drama is told from a gay perspective during the 1980s, when the AIDS crisis was at its apex and death prolonged, but inevitable. It’s a window into the private fears and anguish of those facing the daily loss of their loved ones. Jody is the urbane proprietor of Jody’s Maps, a cartography shop in Anytown, USA. He is consumed with the incongruity of wonky-proportioned Mercator maps and their outsized dimensions of Greenland. He wants a world more clearly defined by Peters’ equal area maps that reflect the actual scale of the continents. He attempts to resolve these conflicting issues and sell maps at the same time. But what’s his angle? Is it a coping mechanism, an innocent transference or is he a con artist? Carl is wary but captivated. The men pass the time with mock tales of Richard Nixon-inspired Shakespearean skits and swordplay with rolled up maps. “We need to play our game,” Jody challenges. “The game where we tell the truth? I prefer to lie a little longer,” Carl admits, spinning tales of Jesus-imaged china as they bear constant witness to the mind-numbing reality of losing their friends. Each day as their relationship deepens and Carl delivers more chairs to Jody’s small shop, Jody’s disconnectedness grows into agoraphobia. “No one prepares you for the fear,” he reveals, words laced with the resentment of how the “straight world” views the deaths of gays from AIDS. But this play is not a redux of Ionesco’s absurdist farce “Les Chaises” or “Angels in America.” It is an intimate and darkly humorous portrait of universal love and loss and the methods we use to cope; in Carl’s case signified by the burgeoning collection of metaphorical chairs representing his late friends. Award-winning director John Vreeke and set designer Jane Fink, a local grad student from George Washington University, deserve kudos. Fink, in particular, does a brilliant job of evoking a musty map store with all its nooks and crannies. 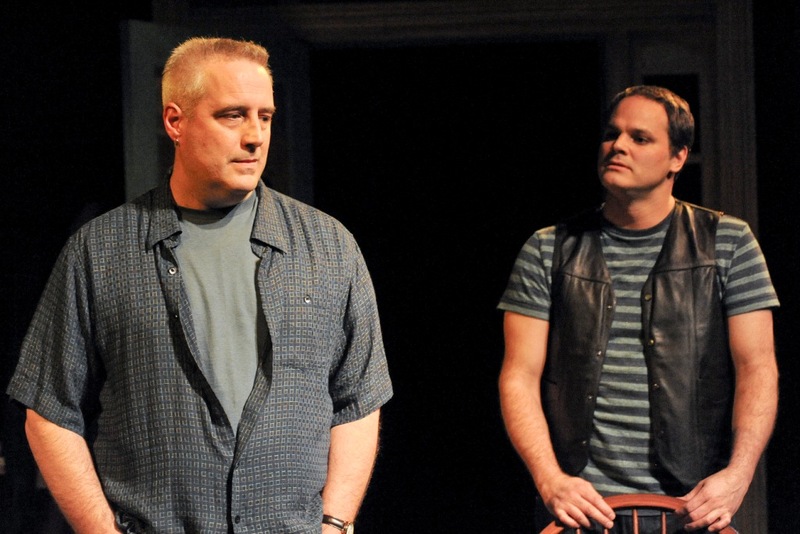 The play also features memorable performances by Michael Russotto (Jody) and Eric Sutton (Carl), who create a believable bond in the face of unimaginable loss with ferocity, humor and fluidity. 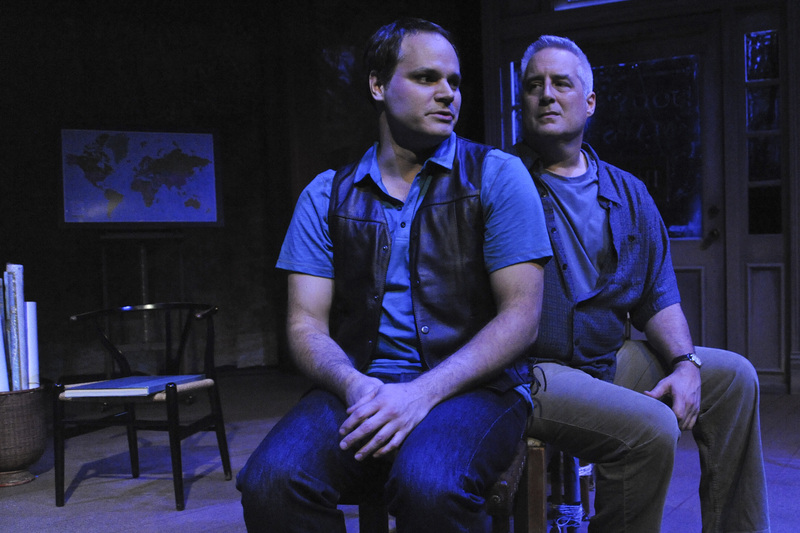 Like the American city where Steven Dietz's “Lonely Planet” takes place, the disease paralyzing the gay community with fear remains unnamed in the powerful and moving production of the award-winning work now playing at MetroStage in Alexandria. 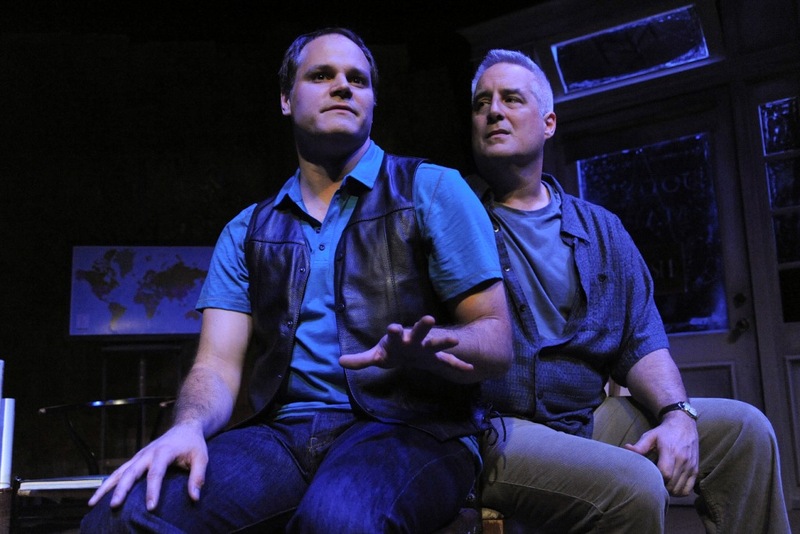 Told through fanciful, game-playing dialogue, the AIDS play that never mentions the word is a story of two men who ponder friendship and death within the sheltered confines of a map store. Poignantly realized in the performances of Michael Russotto and Eric Sutton and under the expert direction of John Vreeke, “Lonely Planet” is about two gay friends: Carl (Sutton), a flamboyant man with a vivid imagination and ever-changing occupations; and Jody (Russotto), a quiet and cautious man who lives in fear of venturing outside the map store that he owns. Afraid to venture out in the world and get tested for AIDS, Jody immerses himself in his maps as Carl turns up time and again toting seemingly random chairs that begin cluttering the shop. With a maddening habit of describing his imaginary jobs, Carl insists on storing chairs there as Jody's frustration and isolation grows. It is only as the play evolves that Jody and the audience learn that both chairs and occupations once belonged to friends who have died, an increasing reminder of everything Jody is laboring to forget: the horrors of disease and the fact that he has yet to be tested for H.I.V. Russotto and Sutton brilliantly sustain a verbal tug of war and create a powerful friendship based on need, comfort and strength. Sutton is a tornado of energy as Carl, who is trying to memorialize his friends in some way. As the map store steadily fills with chairs, Carl gets Jody to confront his fears and leave the shop to get tested for H.I.V. Russotto's Jody is more subtle and indirect, delivering a performance full of effective silences in his many monologues. The two actors make the friendship credible and engaging. “Lonely Planet” is perfectly cast with a handsome set by Jane Fink and piercing lighting effects provided by Jessica Lee Winfield, notably in the final scene where Jody returns to his shop to find Carl's favorite chair sitting in the store. “This is a timeless and universal story, maybe even more important today than it was in 1995,” Griffin said. By examining a relationship between friends and not lovers, Dietz has crafted a haunting memorial to lives lost, and the MetroStage production of “Lonely Planet,” with deep reflections of grief, denial and struggle, is a poignant reminder that the fight against AIDS is not over. With a superb cast and poignant message, “Lonely Planet” is a must-see end to the MetroStage season. The specter of AIDS haunts Steven Dietz's Lonely Planet – and yet the disease is never mentioned by name. But it is AIDS causing the play's lead character Jody to get so wrapped up in his safe world of maps, he has mostly shut out the vastly more complicated real world. What good are maps if not used as guides to a better land, or a better life? That's the central symbolic question of Dietz's richly evocative play, which dates to 1994. Alexandria's MetroStage now offers a charming, understated production of Lonely Planet directed by Woolly Mammoth's John Vreeke and starring Michael Russotto as Jody and Eric Sutton as Carl. 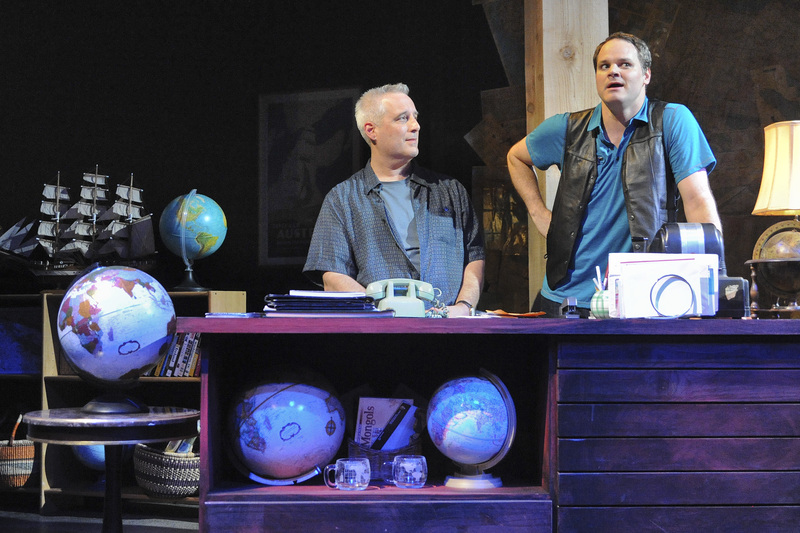 Yes, the poignantly named Lonely Planet is a two-act play with only two actors onstage – though both actors are superb. Oh, wait, it's two actors and empty chairs. Lots and lots of chairs, and more and more as the play goes on. With every visit to see the introverted Jody at Jody's Maps store – Jane Fink's set is as quaint and Old World as the ''map store'' locale sounds today – Carl brings a couple more chairs. This is much to Jody's dismay, especially since the chairs were all previously owned by mutual friends stricken by AIDS. (The play is set in 1988.) By show's end, there are empty chairs everywhere, and a large stack in the back. But Jody is still alive in his world of maps – which eventually, symbolically, includes an HIV test. (For what is an HIV diagnosis if not a map to help guide one's medical future?) Subtly but surely, Jody has also come to appreciate his friendships, most notably his bond with Carl. Because of a script rich in symbolism (and cartography) and light on specifics, and relatively quiet in its dramatic tensions, it can take a while for a viewer to get his bearings watching Lonely Planet. From the get-go the two gay characters carry on as two best friends, arguing over tedious details of everyday life. But eventually, and certainly by the second act, the play and its message come into focus. MetroStage is to be commended for staging a play that's obviously a bit of a challenge both to describe and to find a target audience. Here's to gay people, as well as those directly affected by AIDS (or even cancer), finding this on the map before it closes the weekend after Capital Pride. "Under Vreeke's empathetic direction, Russotto manages to convey stillness and submerged fear without becoming ponderous, while Sutton is the animating force whose behavior sometimes borders on the manic." Lonely Planet, the current production at MetroStage in Alexandria, Virginia, is first and foremost a showcase of acting. Director John Vreeke has guided his two actors, Michael Russotto and Eric Sutton, to give tender and remarkably intimate performances in Steven Dietz's 1994 play about friendship in the age of AIDS. Jody (Russotto) owns a map store in an unidentified U.S. city and the younger Carl (Sutton) stops in to visit several times a day. They are friends, but neither of them knows much about the other—for example, Carl spins stories about all the different places he works, and Jody appears to be agoraphobic, unwilling to leave his shop. More cryptically, Carl collects chairs, no two alike, and stashes them in Jody's store. The play takes place in 1988, when AIDS was still an unquestioned death sentence. Carl states that he has seen 30 of his friends die in the previous six months and only knows for sure who's still alive by whether he sees them at another friend's memorial service. Under Vreeke's empathetic direction, Russotto manages to convey stillness and submerged fear without becoming ponderous, while Sutton is the animating force whose behavior sometimes borders on the manic. Neither of them is dominant; they keep each other in balance. Jane Fink's scenic design manages to show both the expansiveness Jody finds in his world of maps and—as the room fills with chairs—the true, constricting dimension of living and working in a single room. The back wall is papered with brownish, lacquered maps, but a beautiful photo of the earth taken from space hovers above. You often hear theatre patrons (and producers!) say that a production is everything theatre should be. It is entertaining, yet has an emotional core so that you leave feeling like you have experienced something that has entertained yet enriched. It has taken you out of your immediate life experience and allowed you for an hour or two to view a collection of characters with a story to tell—a story separate from your own but with a universality that leaves you with insight and a sensitivity to life’s greatest challenges. MetroStage strives to offer this experience in all its many genres to its patrons each and every time. It certainly happened most recently with Be Careful! The Sharks Will Eat You!, when the brilliant Jay Alvarez told the story of his family’s escape from Cuba in 1964. Audiences left breathless from the experience as Jay described the challenge of escaping while under the watchful eye of the ruling Castro regime. Even though we knew that they escaped because he was standing before us almost 40 years later, we were moved to tears by the commitment of his father to pursuing a better life for his family. Many patrons remained afterwards in the lobby and (over mojitos) stories were shared both by the many Cubans who came to the show but also the Russians, Armenians, and so many others, whose families had escaped oppression. It was an extraordinary opportunity for theatre to provide an enriching experience that was very specific to a moment in time yet universal. This week we open Lonely Planet, Steven Dietz, a remarkable play that is entertaining, emotionally powerful, lyrical, and literary in that Dietz used Ionesco’s absurdist style and his play The Chairs as a metaphor for the situation being depicted in the story. And then there are the maps. Dietz is admittedly obsessed with maps so Lonely Planet takes place in a map store (you will leave the theatre knowing a lot more about the Greenland problem and the Mercator map—did I mention it was also educational?!) Lonely Planet is an exquisite play that will unfold before your eyes as it entertains, enriches, and touches your emotional core---just what theatre was meant to do. Afterwards you will definitely want to read a little Ionesco, and you might even look at maps a little differently in the future. 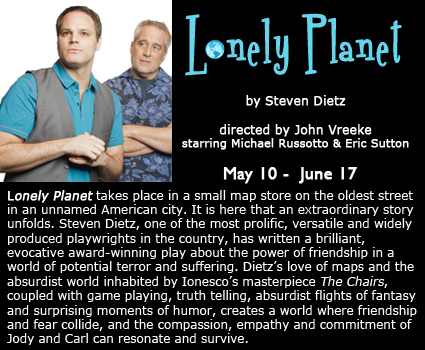 Lonely Planet runs through June 17 at MetroStage. Call 703-548-9044 for more information or go to our website www.metrostage.org . Producing Artistic Director Carolyn Griffin is pleased to announce that the final play of the season, Lonely Planet, by Steven Dietz, will be in performance May 10-June 17, 2012. (Please note that this replaces the play that was originally announced for this time slot, Playing Sinatra). 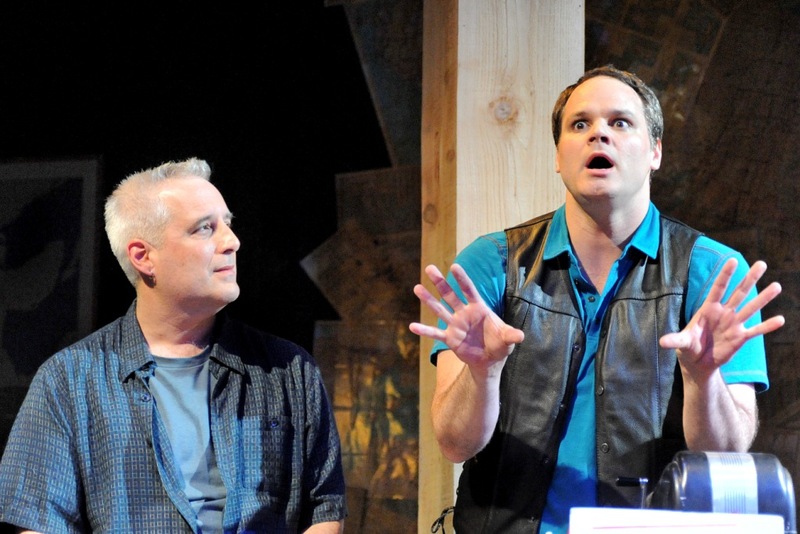 Dietz is one of the most prolific, versatile and widely produced playwrights in the country. Lonely Planet was written in 1994 and is considered a second generation AIDS play although the disease is never named. 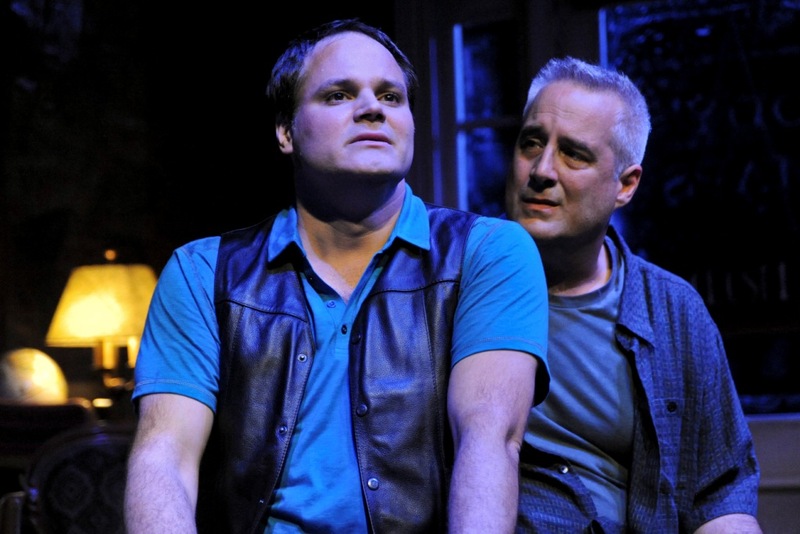 Dietz uses his obsession with maps and his connection with Ionesco’s The Chairs to write a play about friendship in the dawn of the AIDS crisis. The play won the PEN-USA Award for Drama. Lonely Planet is directed by John Vreeke and features Michael Russotto as Jody and Eric Sutton as Carl. 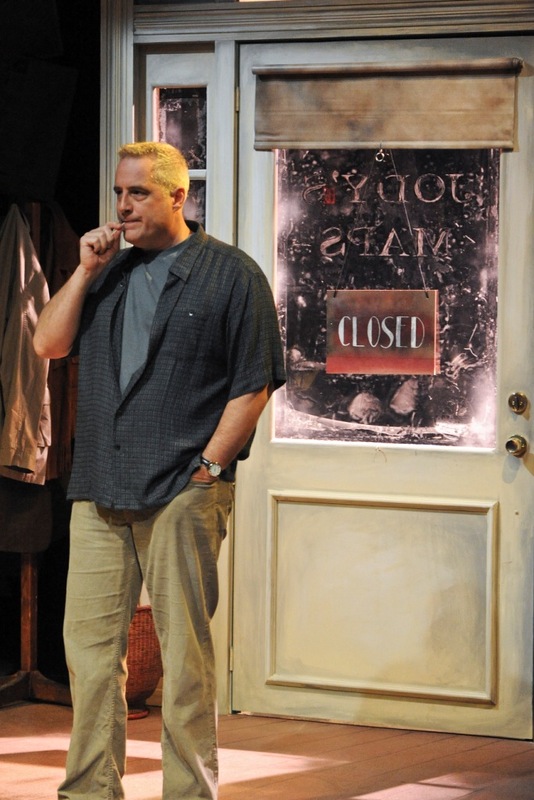 John Vreeke has directed many shows at MetroStage, probably most notably Heroes, which won the Helen Hayes Award for Outstanding Ensemble. Last season he directed The Real Inspector Hound at MetroStage, and in the past One Good Marriage and For The Pleasure of Seeing Her Again. This year he was nominated for Outstanding Director for A Bright New Boise at Woolly Mammoth. 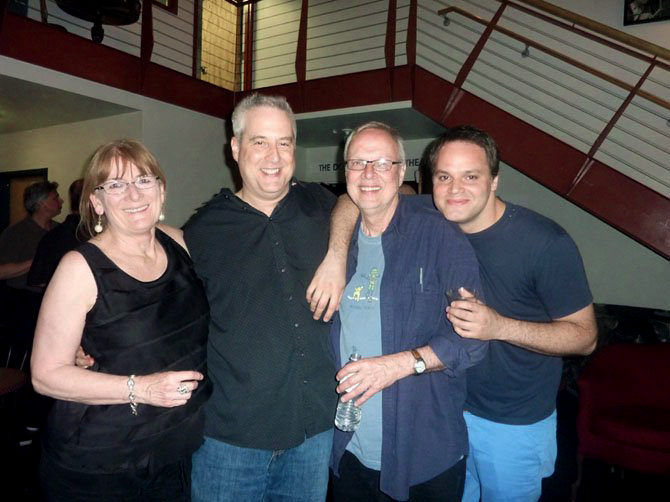 He directed Lonely Planet in 1998 in ArtsWest Playhouse in Seattle. He is a company member at Woolly. Michael Russotto was most recently seen in A Bright New Boise (HH nomination for Outstanding Lead Actor) at Woolly and ART at Signature Theatre. Following Lonely Planet he will be play a Moose in If You Give a Moose a Muffin at Adventure Theatre and then The Elaborate Entrance of Chad Deity at Woolly (directed by Vreeke). At MetroStage he has performed in Rough Crossing and Girl in a Goldfish Bowl. He is a company member at Woolly. Eric Sutton has lived in New York for the past eight years and is a Woolly Mammoth Company alumnus. He was seen in the American premiere of BUG at Woolly and the world premiere of Jump Cut (Woolly and Theatre J). He was in the Helen Hayes award-winning production of Drawer Boy at Round House Theatre. 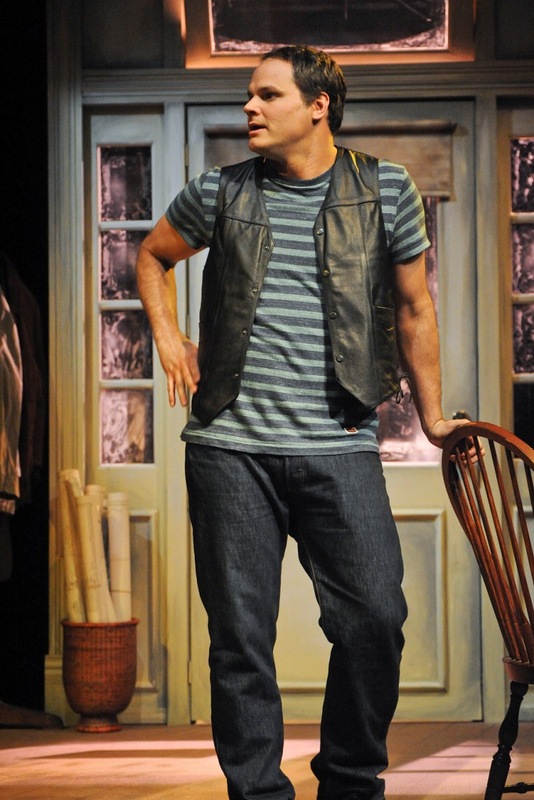 In New York he played Vanya in Uncle Vanya at the Gene Frankel Theatre and was in the world premiere of Corner Pocket also at the Gene Frankel Theatre. Designers for the production are Jane Fink, set design; Jessica Winfield, light design; Ivana Stack, costume design; and Christopher Baine, sound design.